For the human body to develop properly and stay healthy, many processes must work together at many different levels – from organs to cells to genes. Cells are constantly receiving cues from both inside and outside the body—prompted by forces such as injury, infection, or stress. To react and adjust to these cues, cells send and receive signals through biological pathways that can act over short or long distances. Biological pathways help our bodies adjust to all aspects of the environment. When the ambient light levels change from dark to bright, the pupil in the eye opens or closes in response to light. When skin sensors detect rising temperatures, the body sweats to cool through evaporation. If a potential threat is perceived the autonomic nervous system is activated and rapidly increases blood flow to the musculature and raises circulating glucose levels, resulting in an enhanced capacity to fight or flee. These pathways enable one area to communicate effectively with the body as a whole. This communication is essential for both maintaining a healthy homeostasis and responding to internal or external disruptions, large or small. In multicellular organisms the communicating signal must also initiate a cascade of events to contain the problem and initiate a process that leads to healing. Without these biological signaling pathways, we could not adapt to physiological and psychological changes, and survival would be limited. The hospital is similar to our own bodies, in that it has a structure that supports patient care and patient safety. Like any environment, the hospital building contributes to the success or failure of patient healing. What signals are in place when there is a system malfunction or breakdown that can result in patient harm? In the case of smoke or a fire, a smoke detector or sprinkler signaler triggers an alarm and releases water or other fire extinguishing compounds to begin to control the fire. Signaling pathways are not usually in place to communicate the status of building parameters that contribute to patient harm, such as healthcare-associated infections and other medical errors. If we look at the list of preventable medical errors occurring in hospitals as defined by the Center for Medicare and Medicaid (CMS) and then ask how the human body would naturally respond to an analogous threat, we could learn valuable strategies. 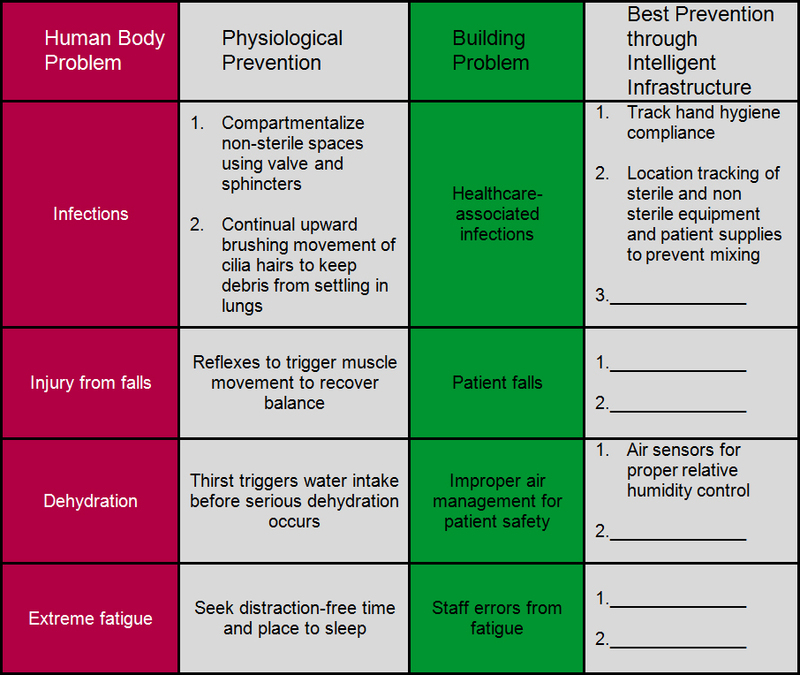 The following chart shows the “best outcome” following system breakdowns in a facility equipped with an intelligent hospital infrastructure that monitors key mechanical systems and environmental parameters to ensure patient safety. Following the examples of the human body, an automated intelligent hospital infrastructure can identify the most vulnerable patients and most critical hospital functions, providing alerting to contain the problem as well as initiate steps to reverse the threat. The ideal design for a hospital building, mechanical systems, staff work areas and patient healing spaces integrates safety measures to minimize the chance for the errors listed above. Using human anatomy as our guide, what normal strategies does the body utilize to prevent injuries and illness? 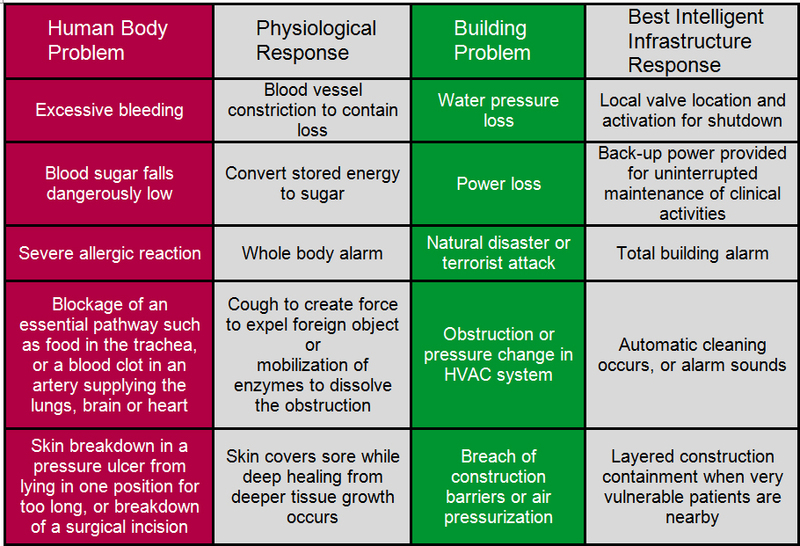 How would you complete the following chart to prevent building problems if designing a new facility or renovating existing space? Let us know in the comments! Well, I have a rash all over my body which would say take more Benadryll!! And if a hospital had a rash of injuries coming in at the same time in every department from emergency to delivery I would be irrashional and call 911. Is that the right answer, doc? Thank you for your comment Robin. From the perspective of a hospital building, a rash is unsightly and irritating. It may just be a fluke, or it could be a hallmark of a worse condition, and if left untreated, could easily worsen and get out of control quickly. In either case, my suggestion would be to investigate further to be sure that there is no underlying condition causing the rash. Very interesting blog. The connection of the bodies safety mechanisms to a hospital facility is very clever. A thought provoking way to think about facility risk and safety. Thank you for your comment, Tim. As you know so well from your island perch in Martha’s Vineyard, each hospital has unique characteristics resulting from the patients they treat and their geographic setting. It’s important to use tried and true tools and draw inspiration from successful models. We are glad you enjoyed this blog. Fresh topic, I love it!! Wonderfully written and extraordinary ability to make connections between different systems. The post does a great job of distilling complex medical info into understandable explanations! Thank you for your comment Susie! I’m so glad you enjoyed the blog. You might also like our recent white paper on the same topic: “The Human Hospital: How to Create an Autonomic Nervous System for Your Facility”. And be sure to connect with with Schneider Electric Healthcare Solutions on Twitter @SE_Healthcare. You can also check out my first blog here. Thank you Dr Taylor, I will look into those suggestions. Looking toward to future posts! Very interesting article. Especially relevant today with increased pressure on hospitals to improve quality and reduce unnecessary costs from infections and mistakes! Hi Cassie, thank you for your comment. Indeed, we must find new ways to help hospitals improve patient care, while also lowering the price of healthcare and stabilizing budgets. Schneider Electric aims to achieve these same goals with solutions that reduce energy costs and improve the hospital environment. This video provides a great look at some of the ways we can help. Simply amazing Stephanie. Thank you for trying to make a difference in all our lives. Thank you Moira! I’m glad you enjoyed the blog. As a residential and light commercial designer with over 35 years of experience, I find Dr. Taylor’s approach to understanding building problems both refreshing and unique. I will think about these concepts in my own work. Thank you Alan. I believe we can only progress when we find new ways of looking at the world around us. Schneider Electric seeks to do the same by addressing customers’ greatest challenges through technology and innovation. And they continually test new ideas in a lab dedicated to healthcare solutions. You present a lucid analogy in this blog: the conceptual relationship between two complicated systems. Just as the body has done creative adaptation through eons, the hospital can provide consistent problem-solving and healing. You present this idea and need powerfully in explanations and examples. This blog prompts me to consider details of body function that I only partially understand, but provoking thought on this topic is a huge step forward, in and of itself. Re staff fatigue: I know, as a reader of literature, that just a ten-minute break from a complex, overwhelming text provides rest, restores perspective and focus, and creates new energy. Just ten minutes! I use the crucial ten minutes in myriad ways, but they always refresh. The fatigued mind needs such restorative variety. Thank you, Jane, for your thoughtful comment. Perhaps places for the staff to detach and rest from the fast-paced physical and mental demands of clinical care is an underutilized tool which would improve patient safety.